Is your helmet really as safe as you think it is? This website has been created to try and educate you as a consumer when buying a helmet, by providing you with all of the information you need to make the correct purchase. We'll try to do this by providing you with information about helmet safety, helmet technology and helmet standards. Primarily aimed at motorcyclists, it also covers helmets for cyclists. All information published on this site has been obtained from people in the helmet industry and publicly available sources. Links to many of those sources are provided in the Further Reading section. There is a lot of information contained below, but we feel it's important so please take the time to read through and digest it. We have not been sponsored or contracted to provide this information by any manufacturer, marketing company, or testing facility. Any opinions or recommendations made are our own, and are based off the information available at the time of writing (September 2017). When a helmet is sold, or even displayed by a retailer, there is no legal requirement to let the consumer know how well a helmet performs. If everyone buying a helmet bought the one offering the highest level of protection, many more lives would be saved. The UK's SHARP rating is the closest thing we have to a performance rating, but retailers have no obligation to display the rating along-side the helmet. The SHARP rating is also only for motorcycle helmets and doesn't properly factor into their rating a helmets ability to handle rotational forces (covered below). All of this needs to change! A traditional helmet consists of three layers. From the outside, you have the shell (this is the part you can see), you then have the EPS (expanding polystyrene) layer, and then the comfort liner which is the padded inside of the helmet. More modern helmets will sometimes feature layers of differing density EPS, and some will have a fourth layer between the EPS and the comfort liner to handle torque/rotational forces (more on that later). Let's assume you're flying through the air after a high-side and you're wearing a traditional three layer helmet. Your head is travelling towards a static object, in this case the ground. 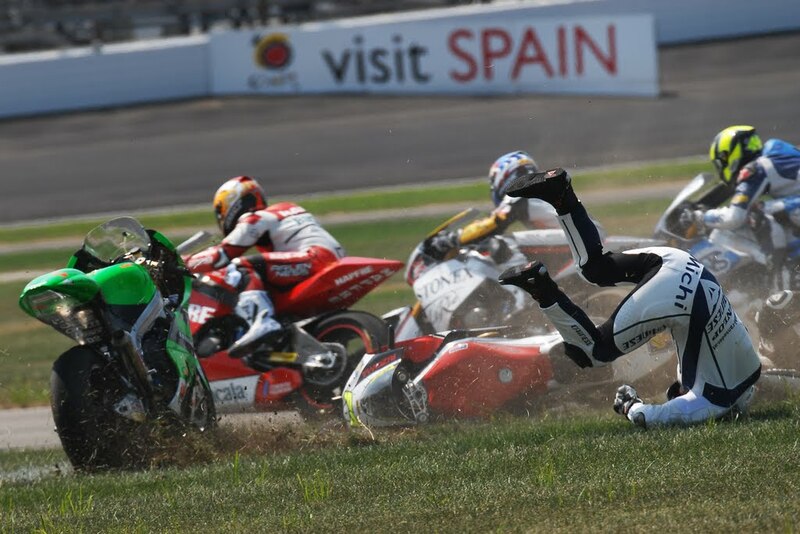 As the helmet comes into contact with the ground, the outside shell is the first thing that impacts. At this point the helmet begins to accelerate towards your head, in a very short space of time. The shell starts to break down while spreading some of that impact over a wider area thereby distributing the force over a larger section of the EPS layer. Your head is still moving towards the ground and it is at this point that the EPS layer starts to work. It absorbs and disperses the impact energy, the result being that the acceleration forces your head experiences is lower because it happens over a longer time period. This cushioning hopefully keeps your brain from slamming into the inside of your skull. Slow your head too quickly (EPS foam is too hard), and the deceleration (correct term is actually acceleration) forces become too high and you become injured or die because your brain collides with the inside of your skull. You could also suffer a skull fracture. Don't slow your head enough (EPS foam is too soft), the EPS layer compresses so much that your skull effectively hits the exterior helmet shell and you become injured or die because your brain hits the inside of your skull. You could also suffer a skull fracture. The EPS layer really is the magic that saves lives. But not all EPS layers are equal, and not all helmet construction is equal. 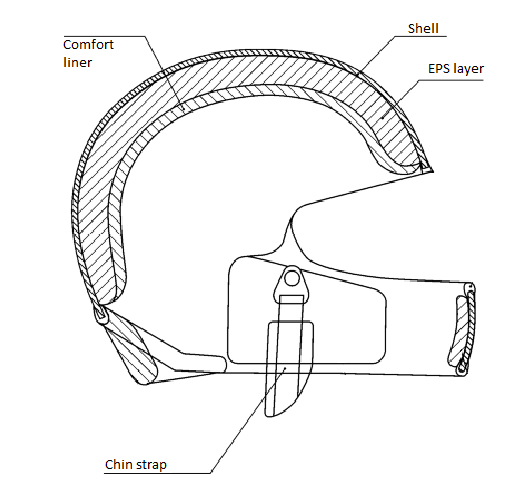 It's worth noting that the exterior shell also plays a vital role in the performance of a helmet because it needs to work with the EPS layer. Shells can be too thick, too hard, too thin or too soft in any given circumstance, so helmet manufacturers try and cover a broad range which means it might not be the best under specific circumstances. This is a relatively new area of focus when it comes to brain injury largely due to advancements in technology. Diffuse axonal injury (DAI) occurs when the head moves but the brain stays behind. In other words, sudden and violent rotational/torque forces cause the skull to rotate, but the brain lags behind the movement of the skull and causes axon fibres to tear. The tearing of this nerve tissue causes disruption to regular communication and chemical processes in the brain. DAI is one of the most common and devastating types of traumatic brain injury. It's a major cause of unconsciousness, and persistent vegetative state. This injury often results in coma and in severe cases, the majority of patients do not regain consciousness. Protection against rotational/torque forces is something that's relatively new to the helmet industry. Quite a few cycle helmets now offer protection against rotational/torque forces. Very few motorcycle helmets offer protection against rotational/torque forces. No helmet standard requires any kind of protection for rotational/torque forces. They probably don't even test for it. You might think that this doesn't matter, but it does. Oblique/Angled impacts with the ground typically result in rotational/torque forces. As your head impacts with the ground, any forward movement you're carrying will likely result in your head wanting to roll as soon as the helmet starts to come into contact with the ground. The more pressure applied, the more the helmet is going to want to roll. That sudden rotation of your head is the rotational/torque force that causes DAI and which is so dangerous. Combatting these forces inside the helmet is vital to improving your chances of survival, or even just preventing brain injury. With the exception of MIPS in the cycling world, Kali Protectives seem to be one of the only companies putting any real new technology into helmets. Composite Fusion, Low Density Layer and Carbon Nanotubes are just 3 technologies the company is investing in. The company CEO (Brad Waldron) is quite open about the industry, standards, and what they're doing to make helmets safer. They also seem to be the only company publicly backing their helmets with scientific research. Watch this video to see what a Kali helmet with LDL (see below) can do. Invented by a physicist named Don Morgan, this technology is basically a coned layer of EPS of a different density. As the cones are crushed, their density increases. You can read about this technology at Conehead Helmets website. Kali Protectives incorporate conehead technology into their Composite Fusion Plus helmets and have featured it ever since. It's now standard in all their helmets. When talking about conehead technology with a representative from Shark at a show once, the response was largely that of disdain. Other big brands would probably react the same way because the list of manufacturers incorporating Conehead technology doesn't feature many big names, at least not in motorcycling. Here is the list of brands incorporating conehead technology (copied from Conehead Helmets website): Kali, Head, Scott Sports SA, Mammut, Cannondale, Motovan Zox, POC, Devonaire, Superseer, Sportatlas AB, Triple Eight, Performance Inc, NRS, AFX, Spiuk, Fly Racing, Acerbis, On One, Raleigh, Alpina Sports GMBH, Nlshiki, Leatt, Anaconda, Foxhead. Traditional helmet construction sees the outer shell and inner EPS layer constructed separately. The EPS layer is then glued to the inside of the shell. This method of construction results in tiny gaps between the shell and EPS layer. Kali Protectives create the outer shell from composite materials, and then mould the EPS layer inside the outer shell to remove any gaps between the outer shell and EPS layer. This in turn removes the often seen double spike in g forces caused by those tiny gaps. The double spike in traditional helmet construction happens because in an impact the shell and EPS layer are not working together, because they are not fused together, but with in shell moulding, the shell and EPS layer act together right from the point of impact which removes the double spike in g forces. Kali Protectives call their in-shell moulding method of construction Composite Fusion. This is claimed to be present in Shark helmets. I couldn't actually find anything about it on the Shark website. Maybe it's an urban legend? The idea comes from cars, you know how a modern car with crumple zones is a lot better at protecting the occupants than a 1970s model. In theory their helmets should work the same way, but with no information about it, who knows? This is a technology designed at reducing rotational forces. It's basically a low friction layer between the comfort liner and the EPS layer that in a collision allows the helmet to slide around your head independently. The best place to get a complete understanding of how it works is at the MIPS protection website. This is another Kali Protectives invention, similar to MIPS in that it's designed to reduce rotational forces. It's a vastly different in design though, it's more than just a slip layer and offers a reduction in rotational forces and linear forces. You can read about it on the Kali Protectives website. To really understand just how good this LDL technology is and how it saved the rider from concussion in the above video, we're going to refer you to another website that featured an entire article on LDL and the problem it's trying to solve. Concussions and LDL - Real World Data. This is a term used by Arai. Their claim is that they make helmets smoother and rounder so that the helmet doesn't dig in. If the helmet just glances off an object it's less likely to impact. In other words, they're lowering the coefficient of friction. The thing is, any change in direction and/or velocity happens due to acceleration which if the helmet isn't dispersing, is being transferred to the head, which means that this would only be beneficial for oblique impacts. There doesn't seem to be any data available to support this. g = g-force. One g is the acceleration due to gravity at the Earth's surface and is standard gravity, defined as 9.80665 m/s². You should know that current helmet standards are still based off research that was done in the 70s. Scientists determined how much force was required to fracture the skull of a cadaver and any force less than that was considered a survivable impact. That force was approximately 300 g. Remember this was long before concussion was considered a serious head injury. For that reason, the helmet standard for impact force was set at 300 g or just below. To put it simply, during the helmet certification process, if the headform inside the helmet experiences a peak force of 275 g or more as it hits the test anvil, the helmet is does not pass the certification. Below 275 g and certification can be granted. Now here's something that you didn't know... Serious brain injury can occur from as low as 10 g.
Let's convert that 275 g into an understandable number with Newtons second law, F=MA. The average human head weighs 4.5 kg. So mass = 4.5 and acceleration = 275 x gravity. We therefore have F = 4.5 kg x (275 x 9.80665 m/s²). Force is therefore equal to 12,135.729 Newtons, which is equal to 1,237.5 kg, or 2,728.22 lbs. That's a high number! It's also worth noting that overall impact energy management is a key factor in helmet safety and the numbers you'll see in the standards below are not representative of how good a standard is overall. Impact tests are just one area of helmet testing and safety, but as I'm sure you can understand, it's quite an important number which is why it is being highlighted! Really good helmets will come in at under 100 g in the impact tests. Put quite simply, currently no standard anywhere in the world requires any kind of rotational force protection. The only requirement for a helmet to be certified is for it to protect against linear impact by not exceeding a certain peak threshold. Which helmet standard is the best? That is up to you to decide. However, if you are on the street in the UK and Europe with a Helmet that is not ECE 22.05 certified, then you are riding illegally. The same is probably true for the DOT standard in America although different states have different laws. This is the standard by which UK and European Helmets must comply. This is the standard by which helmets sold in the US must comply. This is an optional certification by manufacturers. The standards is set by an independent foundation. This scheme was established in 2007 by the British government with the objective of improving motorcycle safety. It rates helmets from 1 to 5 stars for their protection performance. See the section on SHARP. Required for taking to the track in the UK. It has tougher requirements for a helmet to receive an ACU Gold award than ECE 22.05, but a helmet with a 3 star SHARP rating and very poor impact performance can be awarded an ACU gold certification, so while it's an improvement on ECE 22.05, it's still a long way from having track riders safety as a priority. As with motorcycles, this is an optional certification. The standard is set by an independent foundation. They're a joke! They are so old and outdated that they're really not doing the industry or consumer any good. They need to be improved, and helmet manufacturers need to be pushed to sell helmets that offer far better protection. While not a standard, and despite its shortcomings, the SHARP rating is currently the best way of determining a helmet's ability to protect your head when it all goes wrong. This scheme was established in 2007 by the British Department for Transport after research (COST 327) revealed huge differences in real world safety performance of helmets available at the time. SHARPs objectives are to give clear advice on how to choose a new helmet with clear and impartial information on it's relative safety performance. It rates helmets using a 5 stars scale for their protection performance. SHARP testing is similar to testing conducted by other organisations for setting standards. SHARP conduct 30 linear impact tests onto flat and kerb shaped anvils. They then conduct an additional 2 oblique impact tests against a abrasive anvil to establish a coefficient of friction for the surface of the helmet. The impact velocity for the oblique test is 8.5 m/s. Given the COST 327 recommendations concerning the benefits of improved energy absorption, SHARP tests at a higher impact velocity than required by regulation which represents approximately 30% more energy input than required by UN ECE Regulation 22.05. All linear test anvils meet the anvil specification from UN ECE Regulation 22.05. Oblique test anvils meet Method A specification from UN ECE Regulation 22.05. For reference, ECE 22.05 impact velocity is 7.5 m/s (27 km/h or 16.777 mph), SHARP tests at 3 impact velocities, 6.0 m/s, 7.5 m/s and 8.5 m/s (21.6 km/h or 13.4216 mph, 27 km/h or 16.777 mph and 30.6 km/h or 19.014 mph respectively). These are very informative about the ability of a helmet to cope with linear impacts. The colour code is assigned for the peak acceleration during impact at 8.5 m/s, which equates to roughly 30% higher input energy that the ECE 22.05 test requirements. Green Peak acceleration up to 275g: the ECE 22.05 test limit at 7.5 m/s. Yellow Peak acceleration up to 300g: the British Standard 6658:1985 test limit at 7.5 m/s used by SHARP as the maximum permitted value for a 5–Star rating. Orange Peak acceleration up to 400g: the DOT test limit at 6.0 m/s. Brown Peak acceleration up to 420g. Red Peak acceleration up to 500g. Black Peak acceleration in excess of 500g. 32 linear and oblique impact tests are completed for each helmet model to be rated. Coefficient of friction of the helmet shell is calculated using the oblique impact test results. Linear peak ‘g’ and coefficient of friction is used to calculate the equivalent oblique peak ‘g’. Peak ‘g’ values are used to predict the risk of fatal injury for 30 linear and 15 oblique impacts. "Importance" weighting for impact configuration is calculated using distributions of impact location, impact shape and impact speed. Injury risks are weighted according to the impact configuration "importance". Total risk for each helmet at each speed is calculated. Exposure population is applied to the risk. As you can see, the formula for rating a helmet is complex. In short, it boils down to how many lives a helmet is likely to save. You can read about the specifics in the SHARP rating calculation procedure document. "Any helmets falling within the 5 Star rating band are subject to additional criteria; if the peak acceleration seen in any valid linear impact test performed against the flat anvil is equal to or greater than 300g, the rating is modified to 4 Stars." - DfT: The Safety Helmet Assessment and Rating Programme - Procedure for calculating the SHARP safety rating. While SHARP do oblique impact tests, there is no scale or rating of a helmets effectiveness to handle rotational forces made available. A lack of technology to handle rotational forces will not be detrimental to a helmets star rating. There has also been some criticism of SHARPS testing methodology. Critical evaluation of the SHARP motorcycle helmet rating authored by Dr N.J. Mills in the department of Metallurgy and Materials at University of Birmingham, UK. Since the paper published by Dr Mills was released, the DfT or TRL published a response and have also published their testing methods. See Further Reading section for links to papers. Link to the SHARP website. The million dollar question, but if you've read through all of the above info, you're probably beginning to realise that it's not that simple. That is up to you to decide. The authors of this website favour Kali Protectives because their helmets perform exceptionally well in tests, they do their own research, they genuinely care more about saving lives than they do sales figures, and because of their openness about their helmets, standards and testing. They also put their technology into all of their helmets, not just a select few. Unfortunately Kali helmets are not ACU approved, not because they didn't make the grade, but rather because the ACU has never tested them. Ultimately this means that if you want to venture out onto a race circuit in the UK there's a chance you won't be allowed to. Buying a new helmet is difficult. There are so many options to choose from and the price gaps between the upper and lower end can be as much as £800. Pro riders get paid a lot of money to wear a helmet. It's part of their job and they take a gamble that the money they receive for wearing a particular product is worth risking their lives for. If that helmet they put on doesn't perform, no amount of sponsorship money in the world is going to save their lives. Manufacturers know this and it's therefore in their best interest to provide their riders with their best performing helmets. This doesn't mean that all their helmets offer the same level of protection and this doesn't mean that the race replica on the shelves is the same helmet. As a consumer you are not receiving anything in return for wearing a particular helmet. It therefore makes sense to wear the safest helmet you can afford. Styling, noise levels, initial feel and who else wears the brand means nothing in an accident, it therefore makes sense not to buy a helmet based on those criteria. It's worth noting that none of the big names in the helmet world publish anything about what makes their helmets safer than a competitors. Shark, Arai, AGV, Shoei, they all have the same generic text about great ventilation, great view, speaker pockets, comfort, blah blah blah... None of which will help you in a crash. Bell seem to be a bit of an exception, they have a section on MIPS which has made it into 3 of their helmets (at time of writing in 2017). So which helmet should I buy? Simply put, the one that in a crash transfers the least amount of impact energy to your head. How do I find out which helmet did best in the tests? Sadly manufacturers are not keen to publish their test data. The model worn by pro rider X is likely to perform substantially better than the model you can afford, and manufacturers know this. It's for that reason that they're unlikely to publish the numbers. There are probably also legal reasons, not to mention it could hurt their sales figures. Luckily SHARP have done some of the leg work for us, check the SHARP rating before making your purchase. An important note to add: All the science and padding in the world is going to do very little for you if your helmet is too big. When trying a helmet on it should be tight. Almost too tight because the internal soft lining will bed in and it will loosen up. When it's on, you should be able to shake your head from side to side without the helmet moving independently. If it does, it's probably too big. Make sure you have a correctly fitting helmet! There seems to be a perception that cheaper helmets can't offer the same level of protection as helmets three, four, five, even ten times more. That's simply not true. A helmet is basically a spherical beer cooler. It's made from the same stuff, at least partly. The only way to know how well a helmet truely performs is to test it and look at the results. SHARP test helmets and rank them, and while their model leaves a lot of room for improvement, it's the best we've got for now. A cheaper helmet can perform just as well as an expensive one. Finally, brand means very little. Test results don't lie. While the SHARP ratings are not perfect and there's a lot of room for improvement, it's the only system that rates helmets by protection effectiveness. You wear a helmet for protection, so it makes sense to buy the one offering the most protection. Any 5 star helmet should be at the top of your list.